"Guardians of the Firefighters" was born 25 years ago in Levelland Texas. These original pieces of Firefighter Art were first watercolor drawings by Sussan Maria Bell, that have been proudly displayed in many Fire Departments in Texas, New Mexico and Oklahoma. 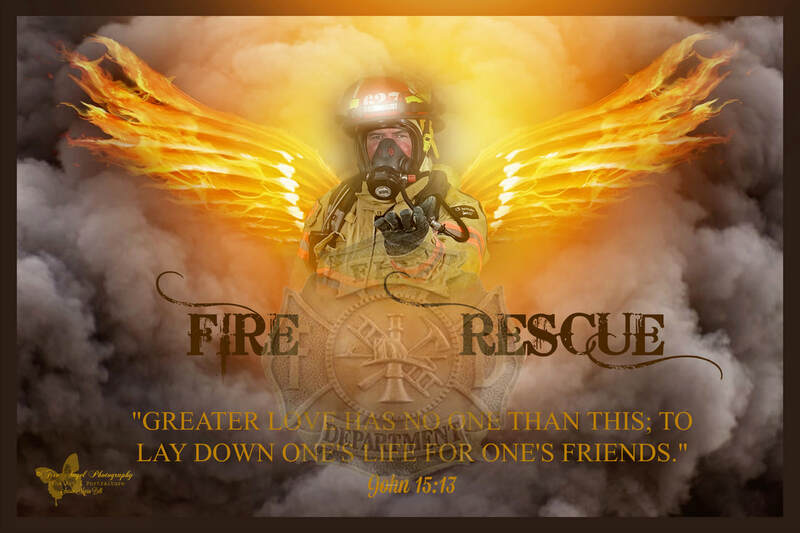 The brain child of this Firefighter/EMT, Artist and Children's Portrait Photographer, these are beautiful portraits of the firefighters and EMS personnel in various scenes of rescue accompanied with their beautiful protectors, the Angels, the Guardians. Sixteen years ago, these images have been transformed from watercolor to original unique portraits. The Firefighters and EMS are actually members of the Levelland Fire Department and the Levelland EMS Service. Sussan uses her grandchildren in many of her compositions. She uses the wives and children of the Firefighters to create breathtaking family portraits that are proudly hung in their homes and offices to commemorate the honorable Fire Service and First Responders. Each unique portrait begins as an idea and then a rough sketch with image details. She brings this idea and sketch to the firefighters and chooses those that will bring her vision to life. A date and time is schedulled for the chosen ones to come to the studio, Fire Angel Photography Studios, with their bunkers and any piece of equipment that is requested. She will then pose the firefighters as needed to make the image of her vision. She will bring the children in as needed and they will pose with the firefighters. Each session takes approximately 30 to 45 minutes to photograph. ***For the out of town departments that are interested in these portraits to hang in their own Stations depicting their own members, Sussan will travel to the station and photograph the firefighters and their families. If you or your department are interested in these portraits, You can contact her on her Facebook page Fire Angel Photography, leave her a message here or call 806-523-5251. She will be more than happy to bring your images to life! For the EMS Series, these portraits are photographed in the ambulance bay with the paramedics and EMTs in assistance with the patients while the attending Angel looks on. Each portrait is unique and gives the viewer the "goosebump" affect. To select an Angel, each woman must have "the look" that Sussan is looking for. This model call takes place several days before any of the firefighters are called. These women are photographed in several dresses and poses to see how well each one will mesh with the firefighters. Once the images have been edited, 4 women will be selected to the be the Angels in the "Guardian of the Firefighters" Series. Their images will be used in the final compositions. Once all the images have been taken, they are then sorted according to each unique portrait to be created. These portraits are composed of many images of fire, fire scenes and smoke taken by Sussan during her 20 years in the fire service. Each portrait can take up to 5-6 hours to build. MORE IMAGES IN THE GUARDIAN OF THE FIREFIGHTER SERIES CAN BE FOUND IN FINE ART AMERICA. ALL IMAGES PLUS CAN BE PURCHASED THROUGH THE FINE ART AMERICA LINK AT THE TOP OF THIS PAGE.